Big Blue Comics (bigbluecomics.com), publishes high-action adventure, character-driven comic books and graphic novels that mostly fit into the broad science fiction genre. With over twenty years of experience in the comic book publishing and retail sectors, Big Blue Comics applies their expertise to craft comics that appeal to fans and retailers alike. 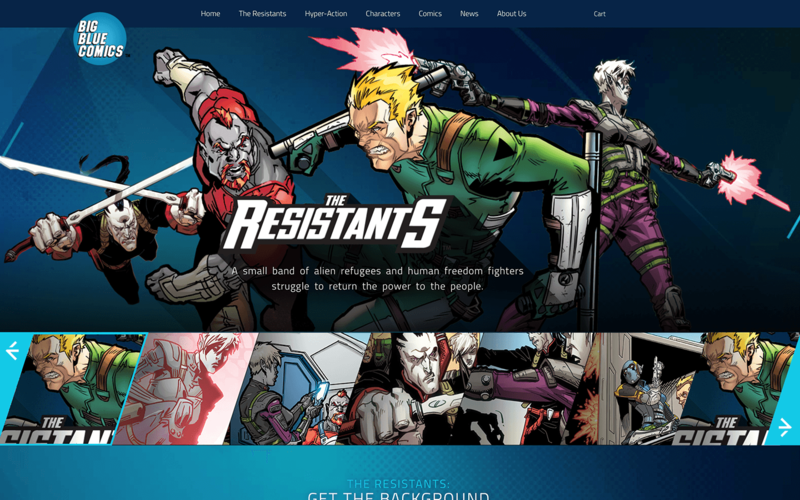 Big Blue needed a creative, visually powerful web presence to match their high-quality comics. 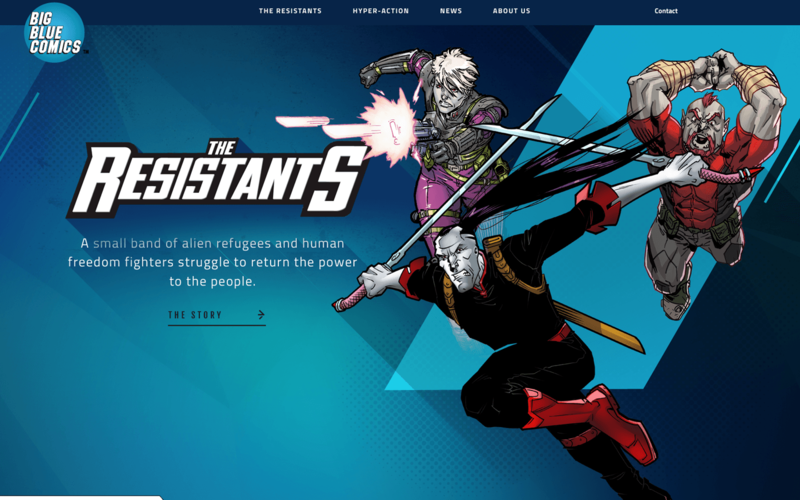 The homepage features stunning visuals featuring their headlining comic, The Resistants. The goal was to give potential readers a glimpse into their world and highlight the characters that drive the story. This is achieved by the ability to select the four main Resistants characters to reveal their background information by dynamically selecting the character images. The innovative design continues throughout the internal pages, with large powerful imagery straight from the comics. The purpose is to keep the user’s interest until they are ready to purchase a book. 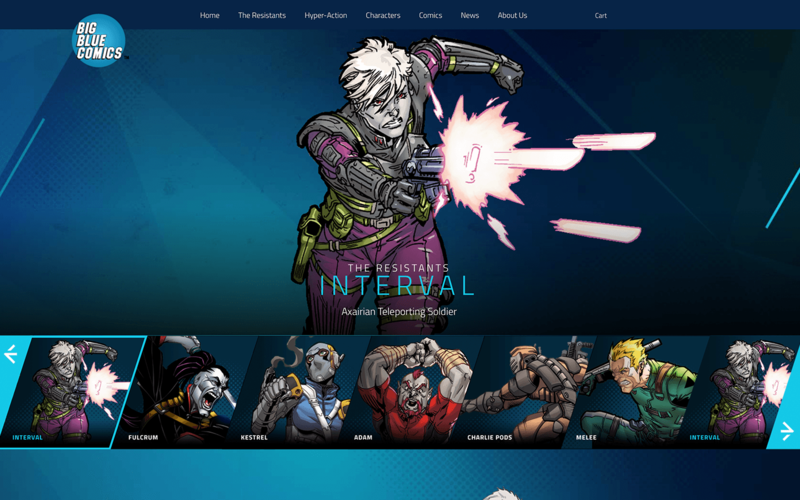 Big Blue Comics had to have an eCommerce functionality built into the site for retailers and consumers alike. In keeping with the other design elements, the store pages utilize clear, strong visuals and descriptions of each comic book offered. We design and develop with a mobile first approach using a solid foundation of SEO (Search Engine Optimization) practices. We pride ourselves on creating sites that utilize the latest in design trends while at the same time keeping tested and true traditional principles. We also design with well UX (user experience) in mind, with the purpose of keeping visitors on your site longer and ultimately driving them to a purchase decision. Big Blue Comics publishes high-action adventure, character-driven comic books and graphic novels that mostly fit into the broad science fiction genre.